Photographs by Simon Cooke and text by Jacqueline Banerjee, 2017. You may use the images without prior permission for any scholarly or educational purpose as long as you (1) credit the photographer and (2) link your document to this URL in a web document or cite the Victorian Web in a print one. Click on the images to enlarge them. 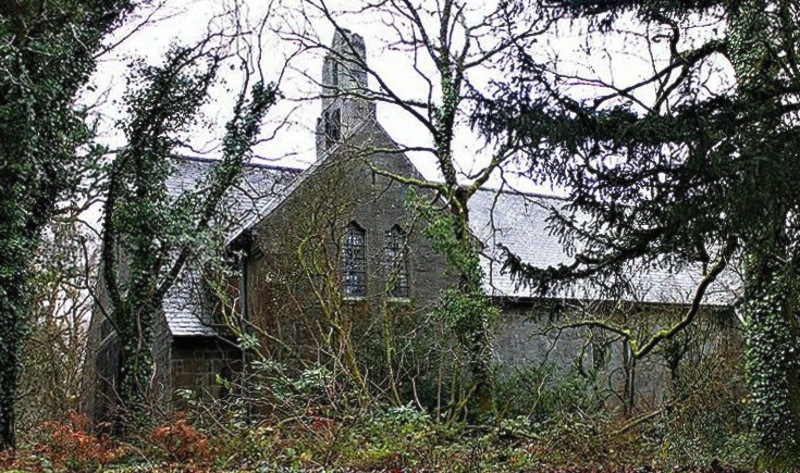 St Mark's Church, Brithdir, nr Dollgellau, Gwynedd, Wales. 1895-98. Brick with local grey-green ashlar facing, and mainly slate roofing. The commission for this Grade I listed building originally went to J.D. Sedding, but he died soon after accepting it and the building was designed by his assistant, Henry Wilson. It was erected by the widow of the Reverend Charles Tooth, who had served as chaplain to St Mark's in Florence, as a memorial to him. According to the listing text, "The church is conceived in a bold and severe style, and shows the influence of contemporary Art Nouveau architecture.... Wilson refers in contemporary correspondence to his inspiration from 'one or two of those delightfully simple churches south of the Alps' and wished the church to appear as if it had sprung out of the soil, instead of being planted down on it." 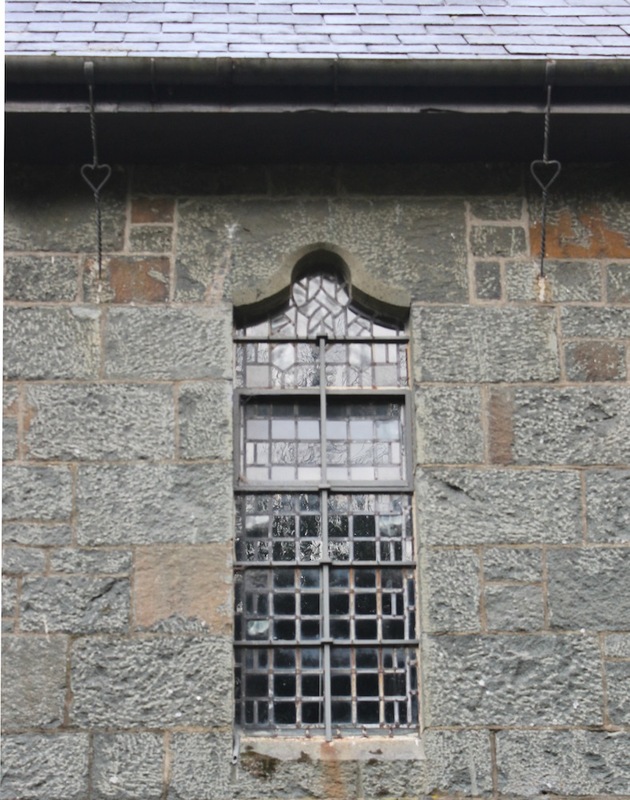 The church is given such a high listing because of the "restrained monumentalism" that he achieved, and also because the fittings he designed for it "represent important examples of Arts and Crafts metalwork by one of the chief figures of the movement." Left: one of the ogee-shaped windows lighting the nave (there are two rows of these). Right: The chancel. The windows are small but there are enough to light the church. The rendered interior walls are painted in rich contrasting colours of red ochre, sky-blue and cream, similar to what Wilson had intended, and unusual enough to give the church a distinctive Mediterranean air. 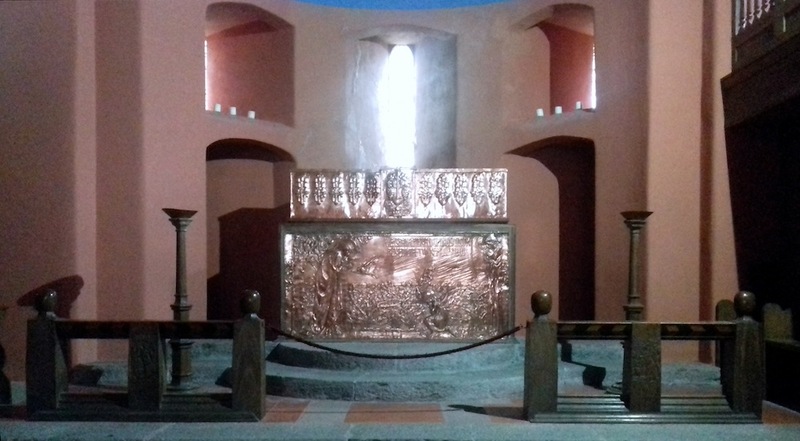 The altar frontal by Wilson is of cast copper ("it is not beaten copper as all previous accounts claim it to be," says Ian Allan, 428), and depicts the Annunciation. As Mary receives the spirit of God, in the form of a dove, two angels are in attendance. These, standing on the right, are said to represent Charles Tooth and his Guardian Angel (Jenkins 262). 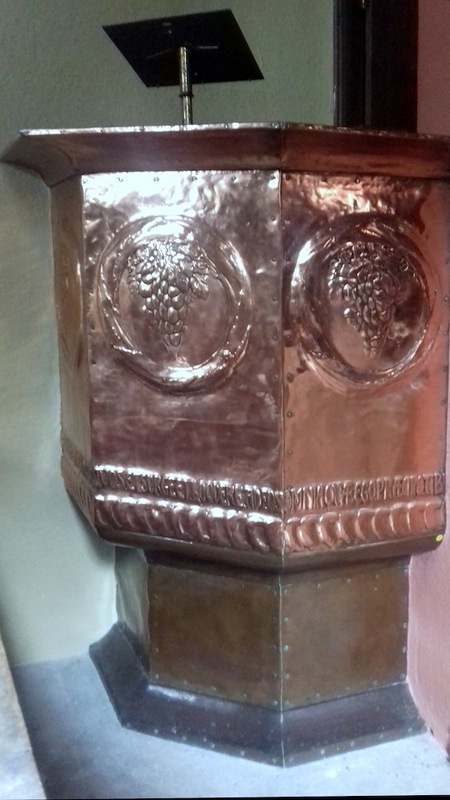 The matching copper reredos features grapes, with the middle part showing a vine emerging and branching, with an abundance of fruit, from a chalice. Left: A closer view of the altar. Right: The pulpit. 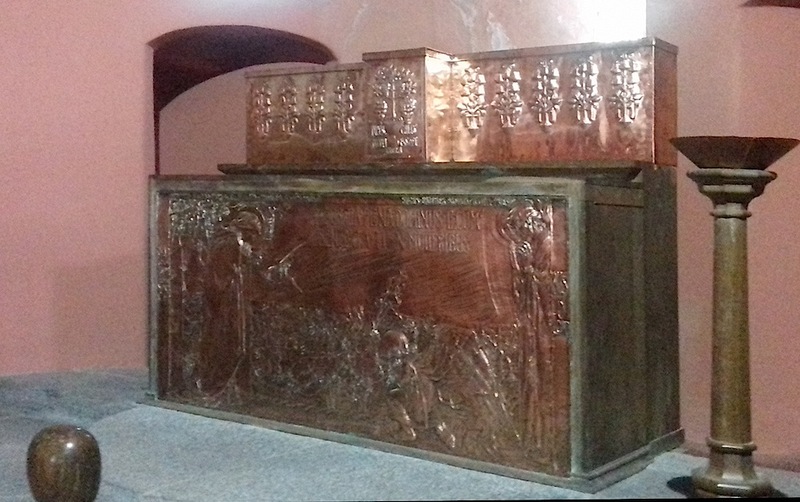 The Arts and Crafts pulpit by Wilson is described in the listing text as being of beaten copper (repoussé). This features bunches of grapes as well, inside wreath roundels, with texts from the Vulgate. Also notable here are the circular lead font, which Wilson based on a design by W. R. Lethaby, and which was actually made at the Central School of Art and Design in London; and the ends of the chestnut-wood stalls, carved with animal shapes — "a hare, tortoise, squirrels, rabbits, an owl, a mouse, a kingfisher and a dolphin" — by Arthur Grove ("Brithdir"). These are very naturalistic and attractive. All in all, Simon Jenkins calls the church "[o]ne of the most remarkable Arts and Crafts churches in Britain.... extraordinary, Italian romanesque in style yet modern in atmosphere" (262). 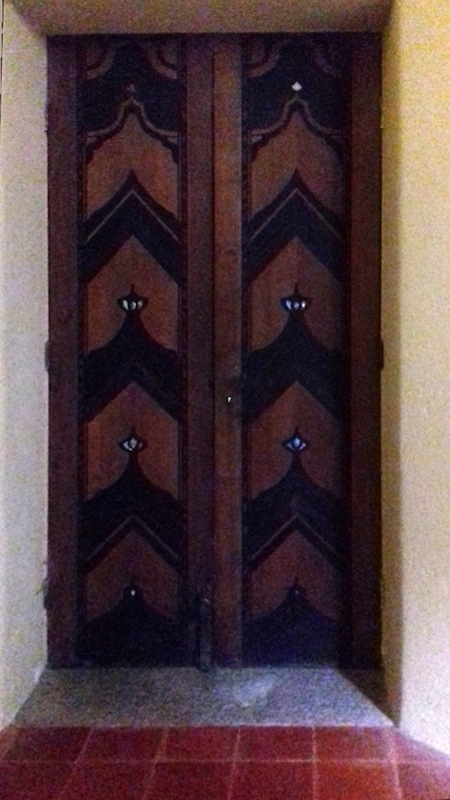 One of the doors, to the north and south, deeply recessed and made of teak and oak inlaid with ebony and glinting white abalone shells (see Jenkins 262). "Church of St Mark Brithdir and Llanfachreth." British Listed Buildings. Web. 1 November 2017. "Brithdir." Friends of the Friendless Churches. Web. 1 November 2017. Jenkins, Simon. Wales: Churches, Houses, Castles. Pbk. London: Penguin, 2011. St Mark's Church, Brithdir Coflein. Web. 1 November 2017.